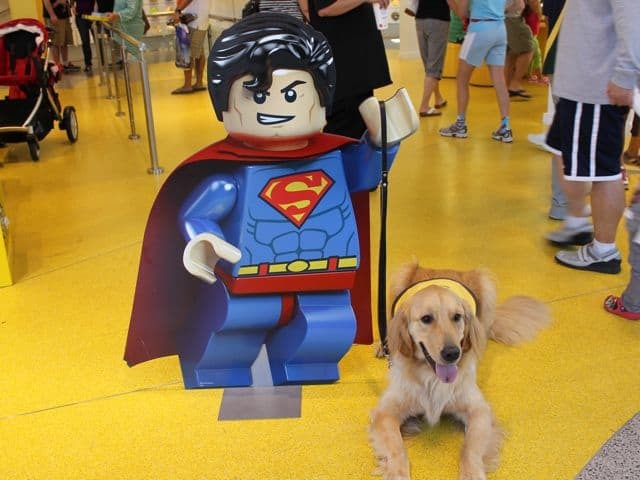 Wordless Wednesday - Lego My Dog Superman! I’m late to respond this week because of our visit to BlogPaws! Is it summer already? I hope your having a good one too! We’re getting back late this week because of our visit to BlogPaws. The picture came out really great! I think Chuy would have been okay with Lego Superman. That picture is fantastic! I love it! I am also extremely jealous that you are near a cool Lego store! The lego store is really awesome! They have some giant lego displays that we didn’t include in any of our pictures. If you have a chance stop by the one at Downtown Disney. Take care and having a great Wednesday! Thanks for the award! We’ve been so busy preparing for BlogPaws we haven’t been able to keep up with a lot of our daily activities. I’ll make sure and take a look at the link you sent us. *and we hope you’re having a great Wednesday! LOL!! What a great picture. It’s about time Superman got a superdog as a sidekick. Thanks! Yep, Apache is a super dog who will hopefully be a guide dog!